June 21, 2011 - "... The latest version of Firefox includes more than 1,000 improvements and performance enhancements..."
Solution: Upgrade to version 5.0. Edited by AplusWebMaster, 30 June 2011 - 05:15 AM. Firefox 5.0.1 addresses promblems with recent Mac OS X releases*. It does -not- contain security fixes." Edited by AplusWebMaster, 17 August 2011 - 06:58 AM. Edited by AplusWebMaster, 03 September 2011 - 02:37 PM. Solution: Upgrade to version 7.0. Solution: Update to version 3.6.23. Edited by AplusWebMaster, 30 September 2011 - 08:37 AM. "... some users may have one or more of their add-ons hidden after upgrading to the latest Firefox version, affecting both desktop and mobile. These add-ons and their data are still intact and haven’t actually been removed... update to Firefox will fix this and restore any hidden add-ons..."
Edited by AplusWebMaster, 15 November 2011 - 09:00 PM. ... exploitation of vulnerabilities... may allow execution of arbitrary code. Solution: Upgrade to version 9.0. Edited by AplusWebMaster, 23 December 2011 - 09:46 AM. "... Firefox 10... January 31, 2012..."
Dec. 21 4:51 pm - "... 9.0.1 the next day?... Apparently Mac users were experiencing crashes on startup..."
December 20, 2011 - "... we have negotiated a significant and mutually beneficial revenue agreement with Google. This new agreement extends our long term search relationship with Google for at least three additional years..."
Edited by AplusWebMaster, 27 January 2012 - 03:36 PM. Release Notes/Bug fixes ... complete list of changes in this release. Edited by AplusWebMaster, 03 February 2012 - 06:35 PM. Last revised: 02/13/2012 - "... allows remote attackers to cause a denial of service (application crash) or possibly execute arbitrary code..."
Solution: The vendor has issued a fix (10.0.1). Edited by AplusWebMaster, 15 February 2012 - 07:10 AM. 2.17.12 - Issue: The libpng graphics library, used by Firefox and Thunderbird as well as many other software packages, contains an exploitable integer overflow bug. An attacker could craft malicious images which exploit this bug, and deliver them to users through websites or email messages. Impact to users: This bug is remotely exploitable and can lead to arbitrary code execution. Firefox, Thunderbird and Seamonkey users could be attacked simply by displaying a maliciously crafted image. Status: Mozilla is aware of this bug and has issued a fix that will be released today for Firefox -and- Thunderbird*. Credit: The bug was reported by RedHat representatives..."
Last revised: 02/17/2012 - "Integer overflow in libpng, as used in Google Chrome before 17.0.963.56, allows remote attackers to cause a denial of service or possibly have unspecified other impact via unknown vectors that trigger an integer truncation..."
Solution: Update to Firefox 10.0.2 or 3.6.27, Thunderbird 10.0.2 or 3.1.19, or SeaMonkey 2.7.2. Edited by AplusWebMaster, 19 February 2012 - 06:27 AM. Solution: Update or upgrade to Firefox versions 11.0 or 10.0.3, Thunderbird versions 11.0 or 10.0.3, and SeaMonkey version 2.8. Solution: Update to Firefox version 3.6.28 and Thunderbird version 3.1.20. Edited by AplusWebMaster, 19 March 2012 - 03:16 PM. 26 March 2012 - "The Mozilla Project has announced* that... the 3.6.x branch of its open source Firefox web browser will reach its end of life on Tuesday 24 April... from that date onwards, no new updates, including security updates and critical fixes, will be released for Firefox 3.6.x... version 3.6.28 from earlier this month will be the final 3.6.x release of Firefox... All Firefox 3.6.x users are strongly advised to upgrade..."
"Firefox 12... Moves to RELEASED on April 24, 2012..."
April 3, 2012 - "Mozilla has blacklisted* unpatched versions of the Java plug-in from Firefox on Windows in order to protect its users from attacks that exploit known vulnerabilities in those versions. Mozilla can add extensions or plug-ins to the Firefox add-on blocklist if they cause significant security or performance issues. Firefox installations automatically query the blocklist and notify users before disabling the targeted add-ons..."
"... vulnerability - present in the older versions of the JDK and JRE - is actively being exploited, and is a potential risk to users. To mitigate this risk, we have added affected versions of the Java plugin for Windows (Version 6 Update 30 and below as well as Version 7 Update 2 and below) to Firefox’s blocklist**. A blocklist entry for the Java plugin on OS X may be added at a future date. Mozilla strongly encourages anyone who requires the JDK and JRE to update to the current version as soon as possible on all platforms..."
A remote user can access the target user's cookies (including authentication cookies), if any, associated with a target site, access data recently submitted by the target user via web form to the site, or take actions on the site acting as the target user. A remote user can spoof certain web sites. Edited by AplusWebMaster, 27 April 2012 - 08:31 AM. Update: Mozilla has rolled the version of ShowIP they make available on their add-on site back to 1.0. They say they are working with the developer on correcting the issue. Hopefully in future their review process will flag privacy issues like this one to prevent users' data being potentially exposed." Edited by AplusWebMaster, 07 June 2012 - 11:43 AM. 25 June 2012 - "... users can completely disable the new tab page feature in Firefox by changing some advanced preferences under "about:config" ..."
Edited by AplusWebMaster, 18 July 2012 - 08:11 AM. Solution: Upgrade to version 15. Edited by AplusWebMaster, 29 August 2012 - 06:24 AM. Sep 6, 2012 - "... unfortunate bug in Mozilla Firefox 15 stable that is preventing the browser’s private browsing mode from working correctly. 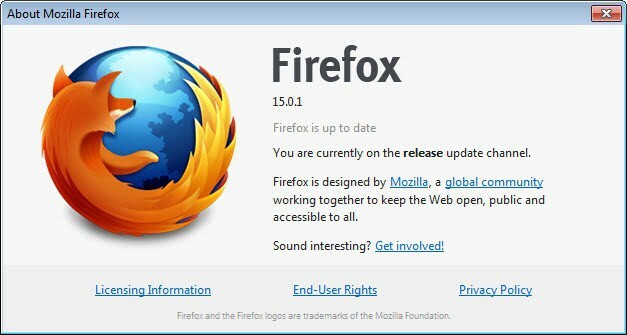 The bug was discovered shortly after Firefox 15 was distributed to users of the stable channel of the browser, and Mozilla has been working diligently ever since to resolve the issue... It is a issue of trust for Mozilla mainly, which can easily be lost if sensitive features are not working like they should. For users the situation may have been even more precarious as it may have forced them to explain their browsing activities to third parties..."
Edited by AplusWebMaster, 07 September 2012 - 09:02 AM. Solution: The vendor has issued a fix (ESR 10.0.8; 16.0). Edited by AplusWebMaster, 10 October 2012 - 06:19 AM. "Impact: The vulnerability could allow a malicious site to potentially determine which websites users have visited and have access to the URL or URL parameters..."
"... regression where security wrappers are unwrapped without doing a security check in defaultValue(). This can allow for improper access access to the Location object... CVE-2012-4192, CVE-2012-4193..."
"... bugs showed evidence of memory corruption under certain circumstances... some of these could be exploited to run arbitrary code... websockets crash affecting Firefox 16... CVE-2012-4190, CVE-2012-4191..."
Solution: The vendor has issued a fix (16.0.1). ... vulnerabilities are reported in Firefox and Thunderbird versions -prior- to 16.0.1 and SeaMonkey versions -prior- to 2.13.1. Solution: Update Firefox and Thunderbird to versions 16.0.1 and SeaMonkey to version 2.13.1. Edited by AplusWebMaster, 15 October 2012 - 06:45 AM. Solution: The vendor has issued a fix (16.0.2, ESR 10.0.10). Edited by AplusWebMaster, 30 October 2012 - 03:16 PM. Edited by AplusWebMaster, 21 November 2012 - 07:38 AM. Edited by AplusWebMaster, 01 December 2012 - 08:10 PM. 9 Jan 2013 - "Mozilla has fixed 20 security holes with the release... 12 of these vulnerabilities have been rated critical by the organisation, the rest are classified as having high impact..."
Edited by AplusWebMaster, 09 January 2013 - 08:07 AM. Edited by AplusWebMaster, 26 January 2013 - 08:35 AM. Edited by AplusWebMaster, 06 February 2013 - 01:42 AM. * How to disable pdf viewer? Edited by AplusWebMaster, 21 February 2013 - 07:08 AM. Edited by AplusWebMaster, 08 March 2013 - 06:51 AM. Edited by AplusWebMaster, 03 April 2013 - 08:30 AM. Solution: Update to version 21.0. Edited by AplusWebMaster, 15 May 2013 - 03:46 AM. ... complete list of changes in this release... 510 bugs found. ... vulnerabilities are reported in versions prior to 22.0. Solution: Upgrade to version 22.0. Edited by AplusWebMaster, 26 June 2013 - 08:59 AM. ... complete list of changes in this release... 606 bugs found..
... vulnerabilities are reported in versions prior to 23.0. Solution: Upgrade to version 23.0. Version(s): prior to 23.0; prior to ESR 17.0.8..
Edited by AplusWebMaster, 11 August 2013 - 06:16 AM. ... complete list of changes in this release... 543 bugs found. Edited by AplusWebMaster, 18 September 2013 - 03:42 AM. ... complete list of changes in this release... 565 bugs found. ... vulnerabilities are reported in versions prior to 25. Solution: Upgrade to version 25. Edited by AplusWebMaster, 30 October 2013 - 06:50 AM. Edited by AplusWebMaster, 20 November 2013 - 05:05 PM. ... complete list of changes in this release... 676 bugs found. ... security issue and the vulnerabilities are reported in versions prior to 26. Solution: Upgrade to version 26. Edited by AplusWebMaster, 10 December 2013 - 06:46 PM. ... complete list of changes in this release... 659 bugs found. Solution: Upgrade to version 27. Edited by AplusWebMaster, 05 February 2014 - 06:11 AM. ... complete list of changes in this release... 865 bugs found. Mar 19, 2014 - "... Firefox 28 was primarily a security update, patching the five Pwn2Own flaws and 15 others..."
"... Firefox before 28.0.1 on Android processes a file: URL by copying a local file onto the SD card, which allows attackers to obtain sensitive information from the Firefox profile directory via a crafted application..."
Edited by AplusWebMaster, 21 April 2014 - 05:50 PM. ... complete list of changes in this release... 3892 bugs found. Edited by AplusWebMaster, 30 April 2014 - 03:11 AM.